piling pressure on him to sanction the deportation of thousands of Ghanaians. 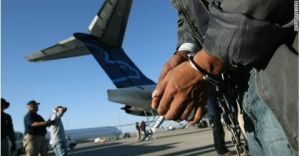 Dr Barfuor Adjei-Bawuah has described as unfair pressure on him to give his approval for hundreds of Ghanaians to be sent home for violating U.S. immigration laws. “It leaves me with difficulty to sanction the deportation of my citizen and I have been trying hard to explain this to the authorities,” he told Joy News’ Elton John Brobbey. According to the frustrated Ambassador, he does not understand why he has to sanction the deportation when there was a contract between the Visa applicants and American authorities in granting entry into the U.S.
His comment follows reports that close to a thousand Ghanaians held in detention centres across the U.S. are awaiting their deportation to Ghana if only Dr Adjei-Bawuah signs for that to happen.